The shift to an accelerated Ascension timeline has occurred. Deep gratitude to all who participated during the Gateway Trigger last week; our work on behalf of the highest interests of all concerned has lifted us to a more expansive, accelerated Ascension timeline. The levels of love, Christed light, and Fifth dimensional consciousness are quite profound. I AM sure that most of you noticed the turning point – the timeline jump – during the X-flare of the 24th. It was sudden, strong, and palpable as the tube torus alignment between timelines occurred. Add it to the many magical moments of this journey as the unexplainable becomes commonplace; my Higher Levels said Step outside, open up to the SUN, and anchor this. A few minutes later, an X-flare that felt like pure Source consciousness. 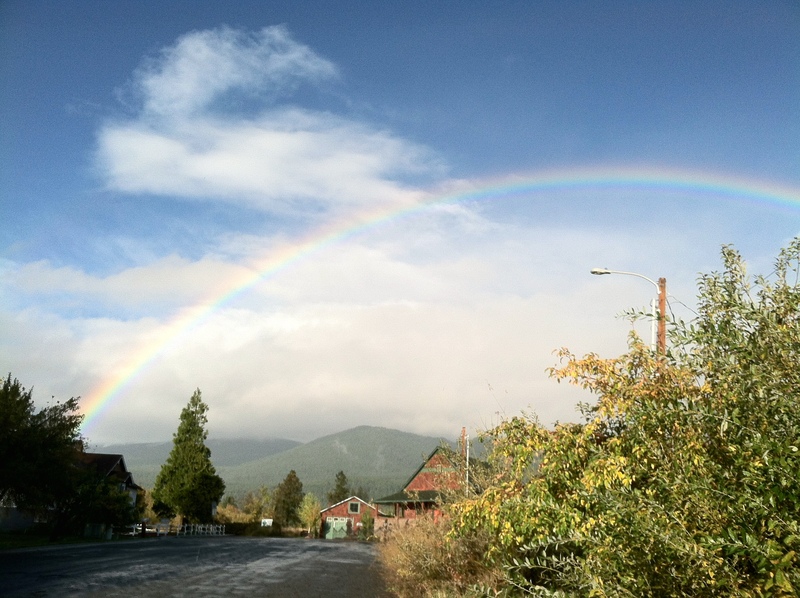 The following day, another nudge to step outside and Witness the completion: A giant rainbow appeared over Shasta as the Trigger passage anchored our intent. Success! There are many things along this journey that I cannot examine too closely. One of them is receiving these gateway windows when certain events will occur. At the beginning of the month, we received dates for a cosmic trigger that was supposed to influence a planetary timeline. Magically, the biggest sunspot in 20 years began to appear over the limb of the SUN. If evidence is still needed by anyone that our Divine Teams are indeed on a Galactic level, let this serve as a smidgen of proof that we and our Higher Teams are indeed UNIFIED. We collectively shifted to a higher Christed Ascension timeline. Timelines work like paths of possibility; they are possible outcomes which depend on collective choices, planetary factors, Galactic factors, and they work in conjunction with the harmonics and infrastructure of Universal intent. For a planetary shift in consciousness, including the evolution of the beings upon it, timelines are designed to support the highest outcomes depending on the collective level of consciousness. Some decisions are pre-arranged (the Shift itself) and cannot be avoided. As the Shift moves forward, the timelines respond to the evolution of the collective consciousness. As we level up, we participate in how this unfolds. You can see why we have said Manifestation requires spiritual maturity and responsibility. While the overall creation of a dimensional shift requires certain events and certain levels of Light to be attained, there is some wiggle-room for free will choices (delays) of the collective. However if the intention on a Universal level is to engage in a dimensional shift, such as we have here, certain things need to happen in order for that to unfold. As the HUman collective awakens and begins to engage with the Shift in consciousness, it is possible to speed up the process of Ascension. Now that we have a good amount of awake and Ascending humans participating fully in service to the New Light, a vibration within that collective is capable of neutralizing the past and accelerating the Shift. This is not about controlling the population, or manipulating other people’s journeys. Because we work in the highest interests of all concerned, a vibration has returned to this planet which empowers Humanity to fully step into their skills as Creators. A true-to-Source Creator being does not dominate or wish to control others in a negative way. A true Creator holds the highest intention of love, light, divinity, harmony, peace, and balance. We bring levels of light to this planet right through our own consciousness, working as a collective force, and activate higher possibilities on behalf of all. This is what occurred during the last Gateway Trigger. You may have noticed that the X and M flares during the Gateway had no associated CME. The light delivered through the SUN contained information – light encodements aimed at acceleration of our intent, rather than the magnetosphere. Our commands for balance and harmony through our pure intention was reflected in the delivery of this these timeline-shifting energetics. We’ve had many major timeline shifts as a collective throughout the Shift in consciousness. Major events or trigger points deliver the higher experience for those with expanded consciousness. It is amazing to watch our unified skills at work. We’ve had plenty of practice in the last decades with group intent; now we are getting a taste of just how powerful it is to focus with pure Source intent in this New Light. The side-effects of this recent Shift are beautiful. Expect dramatic thinning of the veils, deep personal revelations, and stronger interaction with your higher aspects. The ease and grace promised has been delivered. Enjoy it, swim in the 5D flow of it. This beautiful light provides an experience of heightened divinity, purity, and higher sense embodiment. Expect your skills to reflect your highest consciousness; keep expanding, there is so much available that is brand new to our experience. Honor it and integrate the newness into your lifestream. The days of Higher realm/lower realm separation are dissolving. This timeline provides support for flowing fully into the Fifth dimensional experience. Mastery is the application of what you learn as the true Self is unveiled. Own your True Self and honor it properly. These consistent activations of newer self, truer self, will speed up. Integrating what you discover about yourself includes dropping habits, beliefs, patterns which supported the old self. It is important that the High-vibe tribe create new ways of being, moment to moment, to fully support this acceleration. However that applies to you, please engage with it. Take the time to reevaluate and take action on the new creations which serve this higher state of consciousness. I have a beautiful opportunity in November to be in a quiet, private space here in Shasta. I AM seizing this gift to film a brand-new version of the Ascension Course. It will take a good load of work to create what has presented for the new expression. I AM excited for a new level of service, and I also look forward to some offline time to enjoy the New levels of Light available. – The last day for the Kelly Tribe discount on the Ascension Course is this Friday, October 31. Watch that (very fun) interview HERE and use the special link below the video to register. – Those currently enrolled in the Course, or anyone who registers for the Ascension Course through the end of the year will receive the current version and the new version which will come out in January 2015. – Ascension Course participants: Our connection call is on Wednesday, November 5. Check the connection call module for details. – I’ll be having another Healing Conversation with Lauren Galey on November 26! Our next wave of amplified energies occurs November 4-11. Kindwhile, enjoy these transcendental states of revelation, bliss, and harmony. Continue to hold the intention of the highest experience for all concerned; it strengthens the collective experience of New Light. Your activities do not go unnoticed, Beloveds. Know that those higher aspects of you – the Galactic, the Angelic, the Masters – are merging with your consciousness in this now moment. Hold this truth in your heart and amplify it through your deeds, thoughts, actions. Continue to commit random acts of Light. We love you, we bless you, we thank you!